Sunrooms are a versatile, useful and affordable choice that can offer much more than a garage or traditional addition. They are an effective and functional way to add more living space and natural light to your home without leaving home, nothing beats a Sterling Patio Room.You'll enjoy trouble-free get-togethers that can't be spoiled by wind, rain or irritating Insects. And your guests will love the stylish design, spacious setting and Outdoor view from Sterling Patio Rooms. Sunrooms and screen rooms are built to best fit the design of your home. Every project is unique and we offer a variety of roof and framing finishes as well as several door and window options. A well designed sunroom performs three functions that make a house more comfortable: it funnels natural light deep into the house, gathers cool breezes and fresh air, and also provides flexible space for relaxing, dining or just enjoying a view. Oneof the best benefits of adding a sunroomaddition to your home is you're able to enjoy the outdoors from indoors ALL YEAR LONG! . 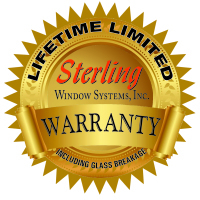 Our team here at Sterling Window Systems, takes everything into consideration before we begin building. For instance, your room would be outfitted with our Energy Efficient Sterling Windows, Factory direct pricing iss one of many benefits of working with us on your sunroom addition—we’ve got more than 10 years of experience in this field, so we’ve seen it all! We know what mistakes to avoid so you can maximize the comfort and functionality of your home. Our goal is to maximize the benefits of your new sunroom: durability, functionality, and aesthetic appeal. We’ll work with you to create a space that appeals to your taste and fits both your lifestyle and budget.